The Number Code of the Bible (gematria) has revealed the Hebrew Year 5760 as the end of the prophetic "Six Days" (6000 years from Adam). The amazing numbers also reveal the great "Third Day" beginning with the Hebrew year 5760. The Codes of the Bible reveal a story that takes us on a magnificent journey through time and into the amazing realities of today's world. 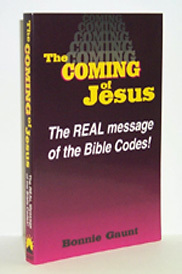 This exciting message found in the Codes tells of the coming of Jesus first as the Babe of Bethlehem and then of His glorious Second Coming and Earth's Great Millennium. It is exciting to find encoded into the end-time prophecies evidence of a time-line for their fulfillment. Much has been written today about end-time prophecies. This book is NOT a repeat of those excellent works. The Codes reveal exciting evidence that has never before been published regarding the Second Coming of Jesus and the New Millennium! The years 1999 and 2006 have been found encoded into the well-known end-time prophecies! The Constellations of the heavens are a "code" telling the same story of the end-time as is found in the Number Code and the ELS Code of the Bible. Psalm 93 is found to be an amazing cryptogram using both the Number Code and the ELS Code. It reveals end-time dates and events. According to Mrs. Gaunt "The Codes are not new. In an ancient document written by Barnabas the traveling companion of the Apostle Paul can be found an explanation of the use of the Number Code (gematria) regarding Abraham. Barnabas showed how the Number Code pointed all the way down through time to the crucifixion of Jesus." The Author Bonnie Gaunt has written and published more on the Bible's number code than any modern author. She has appeared as a guest of Pat Robertson on the 700 Club as well as on the television documentary "The Mysterious Bible Codes." She has also appeared on the CBS 2-hour special "Ancient Mysteries of the world." Her work has received acclaim from many parts of the world. bs00235,The Coming Of Jesus,Bonnie Gaunt,the coming of jesus,bonnie gaunt,jesus second coming,end-time events,gematria number code,els code,hidden messages,codes,bible students,symbols,eschatological concepts,end times,biblical,symbol code,constellations of the heavens,gematria methods,abraham,israelites,adam,passover,disciples,lamb of god,barnabas,apostle paul,clemeus alexandrinus,origin,eusebuis,jerome,jehovah,isaiah,cross of calvary,coats of skin,shiloh,david,judah"